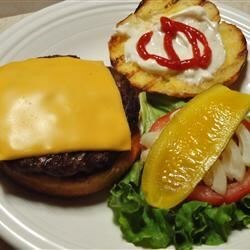 "Fantastic fusion style burgers with a real zing! Season with hot pepper sauce for an even stronger kick!" In a large bowl, mix ground beef, onion and garlic. Season with salt and pepper, and shape into 4 patties. Preheat an outdoor grill for medium heat, and lightly oil grate. Place patties on the prepared grill, and cook 5 minutes per side, or to desired doneness. Prepare buns by spreading 1 tablespoon of wasabi on the bottom half, and 1 tablespoon mayonnaise on the top half. Top burgers with a slice of cheese, and sandwich inside the buns. Watch five terrific tips for building and grilling the best burgers on the block. Really great burger! It was a bit dry , though. I would reccommend adding some Worchestershire sauce or maybe even soy sauce to the burgers before grilling. I also used wasabi mayo. I'm pretty impressed! I used ground turkey instead of hamburger, but still really really good. Thanks! OMG! So juicy and delicious! I added chopped jalapenos. For the first time, I didn't change a thing and I loved it!